I haven't had a chance to blog about my Witchdoctor in awhile so I decided to do that today. I've been doing great on my Witchdoctor throughout Aquila. I've died a couple times while fighting Harpy or the Satyrs. I wasn't expecting the Satyrs to be strong since they usually heal wizards on Wizard101 but I was very wrong about that. 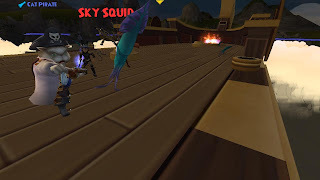 :P Recently I leveled through the Pirate101 Labyrinth with help from Autumn Walker. I thought that dungeon was very interesting and fun. I didn't get to take any pictures of my progress throughout the dungeon though! I'm still glad I made it through that dungeon, thanks Autumn. I had to take a break since I've been trying to quest and blog about both games. Yesterday I had a chance to log back on and level through a bit more. I'm currently fighting squids which aren't too bad. I was really expecting them to be as tough as the Harpy's but they weren't that tough which I'm glad about. I believe I'm just about done with Aquila and almost ready to fight the Hydra. I was watching a Hydra video walkthrough this morning and don't think it'll be that bad as long as we kill the right Hydras when it says. I was worried about that fight for quite sometime until I watched the video this morning. I can't wait to fight the Hydra I'm sure its going to be a lot of fun and I promise I'll make a blog post about that fight. So to finish the update I'm going to finish Aquila soon and I'm sad about that because I'll have to wait until the next world(s) to see new content. I've enjoyed the great storyline in Marleybone and Aquila so far and can't wait to see the rest of the story until the end of Aquila. Pirate101 is such a great game that I have no choice but to be addicted to the storyline, art, companions and everything and can't wait to see the next world(s). Thanks for reading everyone and I hope all of your pirates are doing fine with their quests. :D See you around the Spiral!